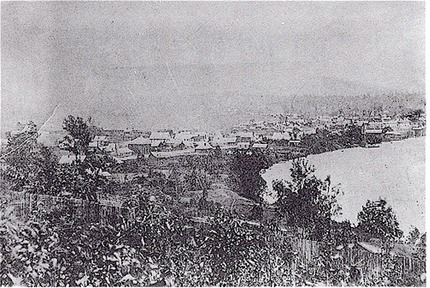 View of South Brisbane looking along Stanley Street about 1869. with Brisbane River on the right. William and Elizabeth Qualtrough and their family lived and worked on Stanley Street for most of their adult lives. As research continues into the Qualtrough family world wide, another character has emerged as someone who made his mark in his own small way, along with that of his family. This time it is on the city of Brisbane, Queensland, Australia. William Qualtrough, baptised 14 July 1823 at Arbory, Isle of Man and son of Richard Qualtrough and Margaret Costain,(See Chart 9 of A QUOTA OF QUALTROUGHS) is similar to Edward Francis Qualtrough (see article on the Great White Fleet ) who was born inRochester, New York in 1851. Both have streets named for them, but for different reasons. William Qualtrough came to Australia in 1849. He arrived on board the ship "JAMES GIBB" which departed London, England 29 January 1849 and arrived in Sydney, Australia on the 9 June 1849. William is listed as No. 32 on the passenger list. Apparently Sydney, New South Wales, was not to William’s liking so he headed north to the area which was being established as Brisbane in what is now Queensland, but at the time was still New South Wales. He married Elizabeth Matilda Wade in North Brisbane on 12 April 1851 when he was 27 years old. By 1853 William had begun what was to become a passion is seems - that of acquiring land, a real capitalist he was!! On the 22 July of that year he acquired an allotment in the Parish of South Brisbane, in the County of Stanley situated on the Brisbane River. He paid 32 pounds. He certainly had an eye for choice real estate, as that area now is one of the most valuable in Brisbane. Also on the same occasion he purchased, for 12 pounds 18 shillings and 9 pence, an allotment in the Town of Cleveland, situated on Shore Street on Moreton Bay. Again an eye for superb real estate, right on the bay. In 1854 he was back in South Brisbane buying another allotment in Peel Street for 36 pounds. And again in 1855 on Stanley Quay paying 48 pounds - getting more expensive now!! William’s wife, Elizabeth, also got into the act of acquiring real estate, buying an allotment in Ernest Street, South Brisbane for 26 pounds. William’s final recorded purchase was that of 18 acres situated "on the high road from Kangaroo Point" in what is now the suburb of Woolloongabba, for which he paid 40 pounds 10 shillings. It is here that Qualtrough Street, named for William, exists. William & Elizabeth had three sons. William George or John Qualtrough was born in 1856 in Brisbane. Walter Henry Qualtrough was born on 13 July 1859 in New South Wales (probably Brisbane) and Albert Richard Qualtrough was born on 15 November 1861, probably in Brisbane also. William’s health appeared not to be the best. Whether this was because of a weak constitution or hard work or a combination of both we do not know. His death certificate states that he was a blacksmith and it is well-known that this occupation is not easy work. He was dead at the age of 46 from "dropsy with heart disease". He died "on the 31st August, at his residence, Stanley Street, South Brisbane….. aged 46 years" (The Courier, Thursday, 1st September 1870). He is buried in the Church of England Cemetery, Dutton Park, Brisbane. His sons were still boys - William aged 14, Walter aged 11 and Albert aged 8. This must have been a difficult time for his widow, Elizabeth, being left with three young boys to raise. However it would not have been a case of being in financial hardship with all the land owned by William and his wife. The difficulty would have been more surrounding that of just being a young woman with a young family of boys to see through to adulthood. Life for Elizabeth did have its lighter side. She apparently loved gardening. In "The Municipal History of South Brisbane" by Brewer & Dunn (1925), we find the following in an article called "A Peep into the Seventies"(page 101), ‘Mrs Qualtrough had a nice garden ‘ and ‘The house, a wooden one, is still existent and occupied" (in 1925). Elizabeth died on 3 May 1903 at her residence in Stanley Street, South Brisbane and is buried with her husband in Dutton Park Cemetery, Brisbane. It would seem that the eldest son, William George, assumed the role of head of the house. He became a clerk upon completion of his education. However his role as head male must have caused him much stress because it seems he turned to alcohol. By the age of 29 he had succumbed to its effects. He died on 25 August 1885 at home in Stanley Street, South Brisbane. His cause of death was cirrhosis of the liver and in his last hours he suffered a stomach haemorrhage. Here we have a young man who obviously found the burdens and responsibilities of life which he had shouldered since the age of 14 beyond his ability to cope. He had not married and died a horrible death. Walter Henry Qualtrough aspired to higher things but his desire to not take life seriously was seen as a failing by his employer. In "A Journalist’s Memories" by Major-Gen Spencer Browne, (page 68) it mentions W.H.Qualtrough as being on the regular news staff of the "Observer" newspaper in Brisbane. Browne describes Walter as "a big handsome chap, who worked well, but who refused to take life seriously." He was also a loyal and willing helper. It appears Walter left his early career as a newspaper reporter, because he later took over what appears to have been a business begun by his late father who was a blacksmith. In "The Aldine History of Queensland" by WF Morrison (1888) it mentions "WH Qualtrough, Plumber and Galvanised Iron worker etc, Queen street…. This business is somewhat distinctive … inasmuch as he keeps in stock a large supply of marble mantelpieces, washstands, grates and all classes of gas and water fittings, and imports iron and all requisites pertaining to the trade. This business is quite representative and deserves special mention in a work on the progress and development of Queensland. Mr Qualtrough has a branch shop in Stanley Street, South Brisbane and a workshop in Grey Street, South Brisbane in which employment is found for forty hands. We have no hesitation in saying, from the way the business is conducted, it will fully maintain its place among the other developments of the colony." Walter Henry Qualtrough died in Brisbane on 21 July 1910 at the age of 51 and is buried with his parents at Dutton Park Cemetery. What happened to the business is anyone’s guess. Perhaps his younger brother Albert was left to run it. Albert Richard Qualtrough, the youngest son, was the only one to marry. He married Eliza/Elizabeth Neville in 1887 in New South Wales, possibly Sydney, because that year they had a daughter they called Iolanthe, who was born in the Sydney suburb of Petersham. It would seem that this family moved back to Brisbane because Iolanthe married Harry Leedham Benson in Brisbane on 4 August 1915. During the 'great police strike' (may have been the General Strike of 1912) Albert was charged with the responsibility of helping to maintain law and order on the streets of Brisbane. For this purpose he was issued with a hand gun. Harry Benson was a German interpreter for the British during WW2. He was the interpreter at the time of Rudolf Hess's surprise visit to the UK in 1941 in which he intended to negotiate peace with the British, but which resulted in his capture and long term imprisonment. Hess same to Scotland where Harry was at that time. He came in 'disguise' and my Harry was the only one to recognise him and he arrested him!! Their daughters Iolanthe and Nerene both attended a boarding school in Armidale, Iolanthe to Miss Green's School and Nerene to NEGS (New England Girls School), formerly Miss Green's School. Harry Leedham's grandfather was Henry Baskerville Benson, a ship's captain and sometime gold prospector in NZ. The Benson family were tobacconists (later B&H) and Henry & Elizabeth had 11 children with Harry Clifton the eldest and Blanche Marian the second youngest. They possibly moved there at the time of his brother Walter’s death in 1910 and Albert returned to run the family plumbing and Galvanised iron business. This has not however been corroborated, but he is remembered as being an 'importer'. Albert Richard Qualtrough died in Brisbane on 12 July 1930 and is buried in Dutton Park Cemetery near his family. His wife Eliza Neville Qualtrough continued to live in Brisbane and died on 26 August 1953 and she too is buried in Dutton Park Cemetery. Further information has come to light that they had another daughter, Nerene Qualtrough. Iolanthe and her husband Harry Leedham Benson moved back to Sydney and had a son,Harry Peter Benson in 1917 in St Leonards, a suburb in North Sydney. There were two more children, Jane and Patricia Benson. A search of Sydney directories and electoral rolls has revealed that Iolanthe and Harry continued to live in Sydney. In 1916 they lived at 86 Shirley Road, Wollstonecraft, North Sydney. Harry’s occupation in 1931 was that of a wool buyer, at 23 Philip Street. Harry Peter and Patricia Benson were both sent to school in the UK and did not see much of their parents when growing up. In 1936/7 Iolanthe and Harry moved to the UK where they lived in a couple of flats and in 1946 moved to a house in Walton on the Hill in Surrey where they both lived until they died. Iolanthe died in 1973 and Harry in 1978. Patricia had a daughter, Jennifer Holmes from the UK. The second daughter of Albert Qualtrough married Renton McSwaine, and had two children, but one died soon after birth. The other Peggy married Robert Boardman Clapp who had three children. Jennie, Gillain and Ross. The eldest child was Jennie Scott, who kindly provided this information for us. While research is not yet complete on this family, we have evidence still, in 2001, in Woolloongabba/Buranda area of Brisbane that the Qualtroughs have indeed passed this way. Qualtrough Street is a street of mainly residences with commercial business operations at either end - the street runs through from Ipswich to Logan Road - two of Brisbane's original "main roads" and the businesses are thus close to the main roads. There is also a rather lovely pub, "The Norman Hotel" at the Ipswich Road end of Qualtrough Street which has been majorly refurbished recently making it a very classy place for eating out and enjoying a good beer and wine. A Journalist’s Memories by Major-General Spencer Browne. C.B., V.D., F.R.G.S. Published by The Read Press Ltd., Brisbane 1927. Judy Murphy, Librarian, Reference Section, John Oxley Library, State Library of Queensland, Brisbane. Beryl Chesterton, genealogical researcher, Sydney, New South Wales. Duncan Turner, Qualtrough Street, Woolloongabba, Brisbane.